Dr. Gary Mormino to speak at Awards Banquet! The Florida Literacy Awards Banquet at Conference is our opportunity to highlight the successful works and accomplishments of those in the literacy community. This year’s speaker is Gary R. Mormino. Gary Mormino holds the Frank E. Duckwall professorship in history at the University of South Florida St. Petersburg, where he directs the Florida Studies Program. A graduate of Millikin University (B.A.) and the University of North Carolina at Chapel Hill (Ph.D.), Mormino has written extensively on immigration and urban America. He has taught at the University of South Florida since 1977. His writing has ranged across continents and time periods. 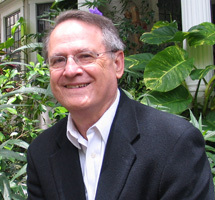 His books include Immigrants on the Hill (University of Illinois Press), The Immigrant World of Ybor City (University of Illinois Press), and Spanish Pathways in Florida, 1492-1992. He is presently working on two projects, a study of Florida and World War II, and a book weaving a history of Florida foodways and culture. This is a ticketed event. Make sure to purchase in advance $24 for conference attendees and $25 for guest. A limited amount of tickets are available for purchase at the registration desk. Don’t forget to Submit Nomination for 2012 Florida Literacy Awards! This entry was posted in Florida Literacy Conference and tagged 2012 florida literacy conference, florida history, florida literacy awards banquet, Florida Literacy Conference, Gary R. Mormino, literacy awards banquet, USF by Florida Literacy Coalition. Bookmark the permalink. sounds great, looking forward to another great conference. Thanks, Karen! You are our biggest advocate. We’re really excited about all the things in store for this year’s Conference!